Converting CAD to USD using Horizon's DLR/DLR.U with CIBC Investors Edge – Tricky! Converting CAD to USD using Horizon’s DLR/DLR.U with CIBC Investors Edge – Tricky! Up until now, it seemed that the Canadian dollar (CAD) was on a death spiral relative to the U.S dollar (USD) when it reached a recent peak of $1.38 CAD for every $1 USD. During that time, selling USD for the best possible price was popular using Norbert’s Gambit for savvy investors. Now that CAD is gaining strength again mostly due to the recent rate hike, buying USD has started to attract attention. One of the cheapest and easiest ways to convert CAD to USD is to buy the Horizons ETF DLR (which locks in your exchange rate); journal the DLR shares to the U.S side of your account (which is now DLR.U); then sell DLR.U in USD. This process is relatively simple with most discount brokerages. I have explained how I traded DLR and DLR.U with Questrade earlier. Journal the Shares. Contact Questrade support (via phone or online chat) and request to journal the shares to your US account as DLR.U. There should be no fees to journal the shares over. You may have to wait 3 business days for your trade to settle before they can journal the shares. Sell DLR.U. Once the shares are in your US account, sell DLR.U using a limit order. As of May 24, 2013, DLR.U costs $9.97 and selling 970 shares will net you $9,670.90. With xe.com (spot rate) quoting 0.96941, this strategy gives you 0.96702. You have now exchanged your Canadian dollars into US dollars at a relatively low cost. Three steps, which are essentially the same for all discount brokers, and you can drastically reduce your trading fees when it comes to converting currency. The only issue is that some brokers work better than others when using this strategy. I’ve mentioned before that BMO and RBC offer automatic journaling which makes them the best when it comes to this strategy, and others like Questrade are relatively straight forward and a little cheaper due to commission free ETFs. But what about the other discount brokers? This article is about a discount broker that’s not as intuitive when using DLR/DLR.U – let’s talk a little about CIBC Investors Edge. My CIBC account is my longest standing investment account which is at least a couple decades old (a long time for someone in their late thirties!). Overall, I like my Investors Edge (IE) account because of its low trading fees, relative ease of use, and most of all, convenience. Up until recently, my IE account allowed me to purchase US stocks in my RRSP while charging 0% surcharge on the currency exchange. I must admit that I really liked this feature about CIBC IE. However, since they introduced a USD RRSP, they have since added a surcharge for currency conversion. With fresh RRSP cash in the account, I needed to convert CAD to USD to continue building my US dividend portfolio. As I’m not a fan of fees, my plan of attack was to use DLR/DLR.U to do the conversion. While the steps to do the conversion are the same as the other brokers, CIBC’s interface is not quite up to speed yet since introducing their new USD RRSP. I had to make a few calls to their trading desk to clarify a few things, but here is a summary of the correct way to trade DLR/DLR.U with CIBC Investors Edge. Buy DLR. Purchase DLR using a limit order with your Canadian trading account. If you have $12,000 CAD to convert and DLR costs $12 (hypothetical), you would buy 1000 shares of DLR. Journal the Shares. The CIBC rep told me that I need to wait for my shares to settle in my account before I can journal. Currently, this is three business days (T+3) but in September 2017, this will improve to T+2. Once the trade is settled, contact CIBC IE trading desk (via phone not email or chat) and request to journal your DLR shares to your US account. There should be no fees to journal the shares over. Journaling the shares over the phone should be very quick and you should see an update in your account within 5-10 minutes. Ask the rep to confirm that the shares are in your US account before hanging up. Sell DLR.U. 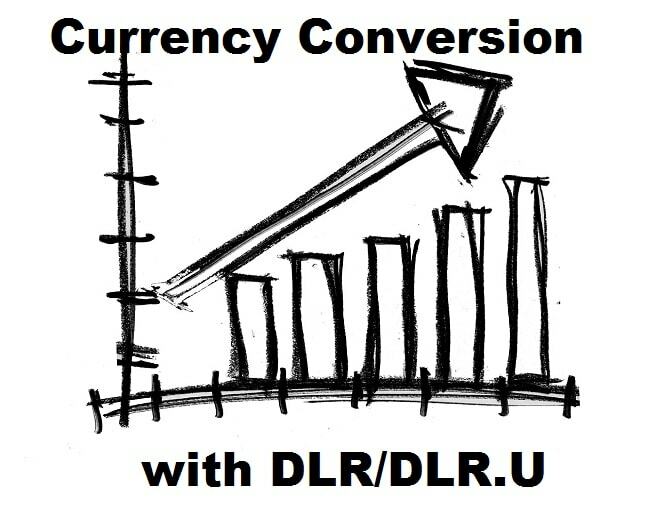 Normally, you would see DLR.U in your US account which you can then proceed to sell to get your USD. However, this is where it gets a bit wonky with CIBC IE and I hope they can fix it soon. Instead of seeing DLR.U in your US account, it still shows as DLR. DO NOT sell DLR from your US account. Instead, on the “Stock Order Entry” page, click “Can’t find security” and type DLR.U (even though DLR.U is not showing in your account). After that, you can fill out the rest of the information for your trade: number of shares; type of order etc; and, hit “Next”. Once you get to the confirmation page, don’t be alarmed when you see the total in CAD instead of USD. It will magically work itself out and sell your DLR.U units properly. I realize that it’s a leap of faith to believe that everything will work out “magically”. When I did this trade the first time, I made the trade step by step online while on the phone with the trading desk. I recommend that you do the same the first time. I really hope that CIBC IE fixes these issues soon as more people will be using this strategy. Once you get through this one time, it should be pretty straight forward after. If you also have a CIBC Investors Edge account, let me know if you have any questions. In the meantime, you can read my comparison of discount brokerages here. TD Direct Investing has the exact same issue — showing DLR in the USD account. Use the same workaround, manually typing DLR.U into the sell order. Have you asked CIBC what their currency conversion surcharge is for currency conversion within Investor’s Edge accounts? I suspect they fall in-line with the other brokerages charging about 2% each way. Will the reps stay on the call while you do all this? eg. in step 2 – Journaling the shares over the phone should be very quick and you should see an update in your account within 5-10 minutes. Ask the rep to confirm that the shares are in your US account before hanging up. It was actually the rep who asked if she could stay on the phone to make sure the trade went through properly. :) 5-10 min may be a bit of an exaggeration. it was more like 20 seconds when the agent confirmed that i was in my account. It may take a bit longer to show up in your online account though. Depending on how much you are converting. Let’s assume you want to convert $10K, so a two percent fee, that would be $200. So unless we can save at least $100 or so. Otherwise, I not sure if doing all these activities will be with the effort. So now that you have some CAD exchanged to USD, how much did you save? Using this strategy results in paying a fee of approximately 0.20% – 0.25% (plus spot rate and commissions) compared to 1.99%. On $10,000 CAD, that’s a savings in the tune of $180. Do this a few times throughout the year, and the savings become significant. At Questrade you’d save about $180 on a single FX conversion (assuming $10k). For people who do this multiple times a year (think people with earnings in USD), then it can work out to be big savings. 1) I converted my CAD to USD when the CAD was above par. Quite a bit of it. 2) I use a margin account to buy my US stocks. I do this for two reasons. The first is to write off the interest expenses. The second is to have the flexibility to convert my money from CAD to USD whenever I want. 3) the third is to convert it using dual listed stocks as you mentioned in your post. 4) my wife gets employee rate and it’s about 0.25% fees, so it’s pretty decent and convenient. We just do the exchange using our cash accounts. Nice post. I still haven’t done this strategy but good to hear its really easy with rbc. Nice post. Another way (which was partly explained here) is to simply journal the shares of the company that trades on both TSX and NYSE and/or NASDAQ . The advantage of doing the DLR trade is the tight spread. Thanks for sharing this FT. When converting CAD to USD using DLR and DLR.U with CIBC Investors Edge, is there a conversion fee in addition to the 2 $6.95 trading feed? I am not sure what the “foreign exchange transaction” implies in terms of fees and exchange rate.